2014 was a bumper year for vinyl sales thanks to a new breed of listener: the twentysomething enthusiast. Jaded by the limitations of digital recordings, they are turning to vinyl as a richer, more tangible way to collect and consume music. Mike Greene, aka Fort Romeau, might be considered a kind of figurehead for this movement. Since going solo from La Roux’s backing group six years ago, he has worked almost exclusively with vinyl, both as a live DJ and as a songwriter and producer. Greene grew up in Chester, where his father’s 10,000-strong record collection formed the basis of his devotion to vinyl, and he began producing music when he was 12. 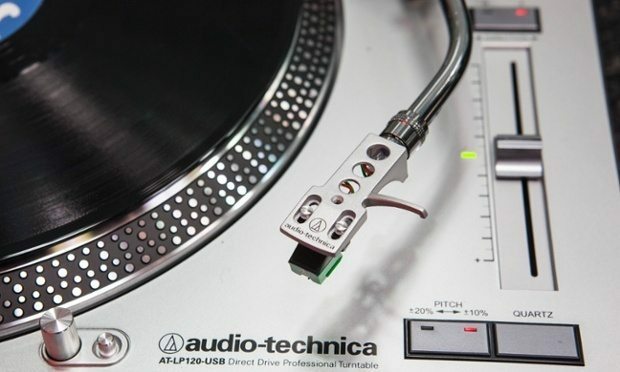 It looks like a rip-off of the Technics 1210, which is exactly what it’s supposed to be. The 1210 was the industry-standard DJ turntable and this is 95% the same, visually at least, although it feels more plasticky. It sounds a bit disjointed, as if things aren’t quite locked together, and I don’t really like the top end. It’s sounds a bit boxy and dark, not very open. This is a shade underneath the others in terms of quality but there are other considerations. If you wanted to DJ at home, for example, this would be your only option as it’s got direct drive rather than belt drive, it’s cheap and comparatively robust. So if you were planning on carting it around, or if you had kids or pets, the practicality might outweigh the sound quality. This is quite an unusual design for a tone-arm. The two weights are designed to give you a broader range of adjustment and more control. My immediate impression is of coherence. The sounds are snappy, the transients are punching through the way they should, the separation between sounds is coming across as it would in as ideal playback. The quality of the individual sounds is better too, and so is the representation of the higher frequencies, which are brighter and smoother. The vocal sits back a bit, which is a matter of taste, but I like it. The overall presentation is very natural, very rounded – nothing stands out too far, but it’s not sludgy either. It sounds brilliant. This sounds great. It’s got more punch than the Thorens, and it’s much more open than the Pro-Ject (see number 5). The soundstage is really broad, it feels like it can breathe. There’s a slight bloatedness to the bass but the high end is crisp and detailed. Not quite as detailed as the Thorens maybe, and perhaps I don’t like it quite as much, but it’s the second best. Kate Bush’s record is super washy, very wet in terms of effects – people don’t make records like that anymore. It’s a demanding record in terms of getting the best out of it, that’s why it’s a good one to try. It sounds great here. The style of the Edwards is very similar to the Rega, it seems to be modelled on the same design. Like the Rega, it doesn’t have a speed switch – you have to physically change the drive belt if you want to go from 45 to 33. Sound-wise, the image is pretty boxy. We’re missing the separation we had with the Thorens and the Rega, everything feels a bit clumped together, like you’ve taken all the ingredients and pushed them into a pile. The sense of space left-to-right is very centred and the presentation has less depth than on some of the others. That said, the vocals sound lovely and the transients come forward a lot. Listening to the Boothman record, the vocal really comes through on this one – more than on any of the others, which some people really go for. I’d say it’s not as broad a sound as the Thorens but it’s more direct, more assertive. There’s more oomph, but it’s less open and a bit drier. For most people it would be more than good enough. The improvement from, say, the Audio-Technica is pronounced, and it’s a huge difference to listening off your laptop. David Bowie Rare CDs, DVDs and More…. ION Unleashes Bluetooth Vinyl LP Player!! ~I am interested in big band (30s and 40s) and classical. Also have some show tunes of the 40s and 50s. I have vinyls and cassettes in quantity and quality. Plus a number of CDss.